When I was a kid, I used to love that book How to Eat Fried Worms. Maybe it was reading the book multiple times that ignited a little mischief in me the other night. Pierce said, "Mom! What's for dinner?" as I worked away at the stove. "Worms," I casually responded. Reid, listening in, said in a whiny 3 year old voice, "Mooooooooommm! WORMS ARE YUCKY!" And Pierce said, "Mom, we're not REALLY having worms, are we?" To which I giddily lifted my bowl and said, "Sure we are, look!" The boys examined this very closely. When dinner rolled around, they were hesitant to try the spaghetti squash worms, lovingly tossed with parmesan, garlic salt, and a bit of butter. But then soon enough my twin three year olds were happily declaring, "Mom! Worms are YUMMY! I like worms!" As for me...well....I had to agree! Liked that, it was a cute story! Great way to get them to try something new too!! 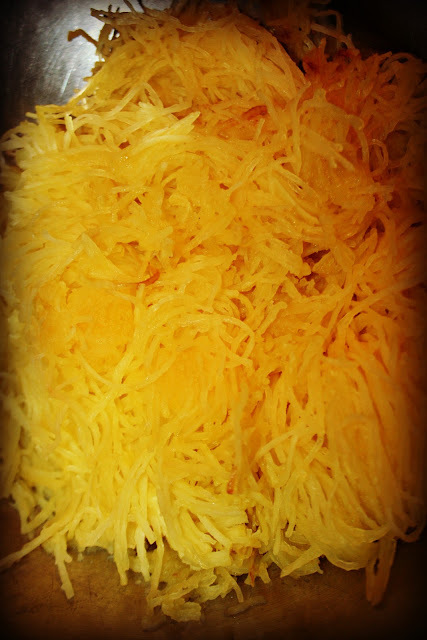 We love spaghetti squash here! Although, I have never called it worms :-) It definitely sounds like a fun idea though, that my kids will love! Great way to get them to eat their veggies. Looks delicious. We love acorn squash, but once in a while change it up and have the spaghetti squash. It's pretty yummy too. But worms? Nope... not in this house. Haha! I just love your style! That is my favorite dinner!!! YUM!!! Ha, good one! It's nice that the boys tried it and found out they liked 'worms'. You've got some adventurous boys! Very cute, and I like worms too. What fun for your kids! LOL.... Now they will tell all their friends their mom feeds them worms. I love spaghetti squash!! Way to work their propensity for grossness! After reading this, Lisa, I like worms too! Very yummy!! I love love love spaghetti squash! Especially with parmesan cheese and roasted red peppers. Mmm Mmm! Calling it "Worms" is a great way to get kids to eat it! P.S. Thanks for your message yesterday, it meant a lot. I have to say I like worms too. Haha so cute! I've only tried spaghetti squash once before, but I loved it! I need to make it again. You feed them "worms" aka spaghetti squash and I feed them acorn grubs...aka acorn grubs. Reid swallowed three at a time this morning and chomped them down with a big smile on his face! Lol. Worms to look yummy! I love spaghetti squash! When you were a child you read that book? I saw that movie and read the book with my grandson a couple years ago. I am so much older than you. I loved it though. I've never had spaghetti squash but have wanted to try it ...... Now I definitely do! This made me smile! And I love spaghetti squash too - you just made me hungry. Oh yes- the best worms ever especially with cheese on them! They look good to me! I do have to find me some Squash, I never seem to see it in the stores. I mix it with egg and parmesan cheese, put it in a glass pie plate and cook it at 350 until it's cooked. Then I add tomato sauce, cottage cheese, garlic, onions, sometimes Italian sausage and Mozzarella cheese on top. The boys aren't fans, but my husband and I love it. The boys aren't fans of pasta in general. I can't believe they are my children when it comes to that. I always forget how much I like spaghetti squash. I think I just may have to pick myself up one next time I am at the store. I'll have to try the parm cheese on it, i've never had it that way. YUM! Those kinds of worms ARE yummy! And I read that book several times as a child. Loved it! Yum! Those worms are good!